The first report of "Iraqi Media House" monitored 362 Iraqi media that are being published in Arabic and own websites on the Internet. Also it monitored the wide map of various websites, and recorded observations on their modes of work, news update, and level of their benefits of technology means that have occurred in the electronic media fields. 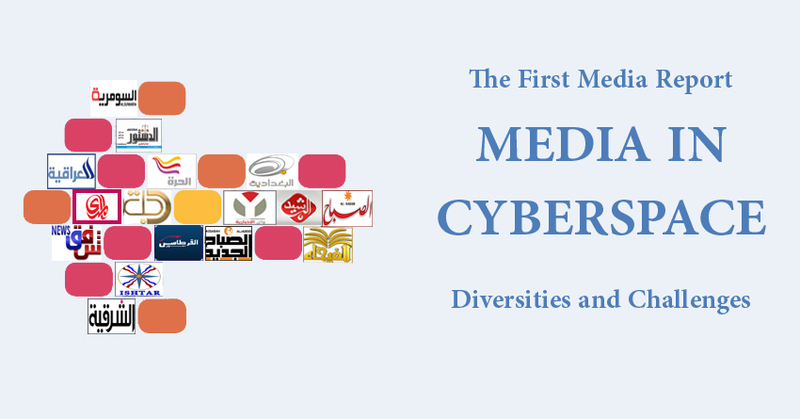 "Iraqi Media House," believes that the first report is an attempt to discover and sort the media landscape features, that available through the World Wide Web, by introducing data, numbers, comparisons and approximate statistics to help publishers and journalists reach the best possible way to improve performance and appearing with greater quality. The IMH ''Iraqi Media House" mentions that its first report doesn’t include Iraqi media that published in languages other than Arabic, which will take appropriate space of monitoring in the coming reports. Also the IMH indicates that the first report, which is available also in Kurdish and English monitored the media phenomenons related to televisions and radios only through their websites, as it will allocate monitoring to the visible and audible ether in a separate report later. The report monitored 59 Iraqi newspapers, and 18 magazines, which is being issued by independent institutions, and a variety of sponsors, including parties, blocs, and figures, which are political, governmental and quasi-governmental. Monitoring Report of the newspapers and magazines included comparisons, statistics, and observations about their copies' count, pages number, whether, or not they own mobile phone apps, or websites, in addition to the websites quality if any, like interactivity, commenters, and number of readers. Also, the study included the specialities and concerns of the monitored newspapers and magazines (general, political, cultural, sports, and art), their possession of addendums, as well as their issuance frequency (daily, weekly, monthly, quarterly). The number of newspapers that refer to the genuine name of the chief editor is 51 out of 59, viz 86%. The total newspapers that update their own websites and publish the newspaper contents for the next day is 19 out of 47, ''32%''. The number of newspapers that own addendums (cultural, sports, artistic) are 10 out of 59, ''17%''. The total newspapers that own mobile apps is 3 out of 59, ''5%''. The number of newspapers that publish ads in their paper edition (governmental, civil, and official) is 34 out of 59, ''58%''. The total newspapers that own websites is 47 out of 59, ''80%''. The number of newspapers that let their websites interact by publishing news throughout 24 hrs is 14 out of 47, ''30%''. The number of newspapers register the number of their website readers is 20 out of 47), ''43%''. The newspapers that allow comments by their visitors are 20 out of 47, ''43%''. ⦁ The newspapers that consist of 8 pages are 11 out of 59, ''19%''. ⦁ The newspapers that consist of 12 pages are 26 out of 59,''44%''. ⦁ The newspapers that consist of 16 pages are 16 out of 59, ''27%''. ⦁ The newspapers that consist of 20 pages are 4 out of 59, ''7%''. ⦁ The newspapers that consist of 24 pages are 1 out of 59, ''1.5%''. ⦁ The newspapers that consist of 32 pages are 1 out of 59, ''1.5%''. ⦁ The number of public newspapers is 53 out of 59, ''90%''. ⦁ The number of sport newspapers is 4 out of 59, ''7%''. ⦁ The number of cultural and artistic newspapers is 2 out of 59, ''3%''. ⦁ The report shows, regarding to newspapers, that the utilization of the available technology resources is below the required level, as well as the lag of some newspapers in adopt their own websites. ⦁ The report recorded observations on the small number of newspapers which published with largest number of pages, compared to the publications issued in the region, taking into consideration the financial factor and declining of advertising rates. ⦁ Iraqi newspapers focus through its general coverage on the political and security fields, while their interest wane in cultural, sports, economy and social entertainment material sectors, this seems clear by the percentages of their specialized addendums. ⦁ The percentages which have been monitored for newspapers that allow comments by visitors are few, this indicates fears by some newspapers of dealing directly with readers notes. ⦁ (12) newspapers out of the 59 that have been monitored avoid mentioning the genuine name of their chief editor, what could be considered as an attention worthy indicator, which reflects a kind of injustice against the actual editors of those newspapers; The lack of reference to the editor, as a responsible person for published materials in the newspaper considered as a fault about correspondence, and judicial responsibilities that are directed to the editor according to his job title. The report monitored 18 weekly, monthly and quarterly magazines, which range in number of pages from (26 to 164) page, viz (63) as an average number. Only 1 magazine out of 18, owns mobile apps, viz 6%. The Number of magazines which own ads is (7) out of (18), 39%. The Number of magazines which own Website (7) out of (18), 39%. ⦁ The number of weekly magazines (3) out of (18), 17%. ⦁ The number of monthly magazines (14) out of (18), 78%. ⦁ The number of quarterly magazines (1) out of (18), 5%. ⦁ 6 public magazines out of (18), viz 33%. ⦁ 5 cultural magazines out of (18), 28%. ⦁ 1 sports (1) magazines out of (18), 5%. ⦁ 3 magazines out of 18 concerned with children, 17%. ⦁ And only 1 women's magazine, out of (18), 5%. According to the monitoring records; The Iraqi magazines are the least attention among the press publications and products, which reflects the neglect of Iraqi publishers to this type of publications, and this resulted in the absence of journalists who are specialists in magazine industry, except for a few cases. Also, most of the monitored magazines are being edited with a language that more suitable for newspapers, than magazines. ⦁ Dozens of newspapers and magazines are being launched annually, but most of them stop after several weeks or months, due to the lack of funding, and inability to engage in a competitive market. ⦁ Most of the magazines and newspapers refrain from revealing the actual number of their released copies. ⦁ Sale imports of printed copies retract with the time passage; ''printed newspapers market have clearly broke down after 2010, as a result of development of the internet service, and spread it at homes'', said experts in Iraqi Media House. ⦁ In return to the printed copies popularity decline, newspapers and magazines, didn't try to develop their performance at the level of marketing, paper quality, or modern printing techniques in colours, images, and services. ⦁ Most of press issuances in the country are limited to Baghdad, (except Kurdistan region), while the majority of provinces are experiencing the absence of their own local daily newspapers, because of high costs, and travel of some journalists to the capital to look for jobs. ⦁ Most printing operations are done in Baghdad, as a result of the lack of printing houses in most provinces, also the provincial newspapers, whether independent or affiliated to governmental institutions, don't have websites, and thus, they resort to social network sites, in order to promote their own productions. ⦁ Update timing of the websites related to the newspapers varies, it ranges in general between 10 pm - 9 am, and it has been noted that all the newspapers sites are limited in spreading the same news which have been published by their printed copies, update at a specific time, and don't re update the website throughout the day to keep up with news coverage. ⦁ Some newspapers have their own printing presses, but they mostly relies on commercial presses, and some of them print more than 8 newspapers, daily. ⦁ Most newspapers rely on governmental advertisements, or private sector companies, or partisan support, to finance themselves, and don't count that much their printed copies' sales income, due to a decline in purchase rates. ⦁ The majority of newspapers share limited exclusive news, while the bulk of their news production adapted from official statements and news of local and international agencies. The monitoring plan included 100 Iraqi agencies and sites, which publish news materials on the Internet. Also this category shows that the number of journalists who work for the news agencies is larger than of those who work for news sites. Monitoring showed that 21% of the sites and news agencies refer to the name of the chief editor, while 79% do not. 29% of the news sites and agencies do not mention the time of publication, as the visitors remain unaware of when the event took place, or when it was updated. 75% of the sites and agencies don't refer the editors or reporters names, while 11% use acronyms, and 14% put the genuine names of them. 67% of the sites and news agencies rely on their own sources of information, while 33% don't mention whether the published news rely on their own resources or not. Also, 41% of the sites and agencies mention the names of foreign news sources, while 59% do not. 64% of the sites and news agencies publish opinion articles on their websites. Only 13% of the news sites and agencies have their own mobile apps. 69% of the news sites and agencies indicate the number of visits or readings for their published news. ⦁ The report found, that what is missing in some news sites and agencies, is to be keen on documenting sources of information, and whether they have been borrowed from other publishers or media product; This phenomenon constitutes a loophole concerning the ethical rules of the profession and commitment to property rights for the information, photos, and other statements that broadcast through those sites. ⦁ The report recorded an obvious richness in several news outlets in the Iraqi media scene, which started after 2003, which reflects the publishers’ response to the recipient needs for the information and news throughout time. ⦁ The report indicated the neglect of many agencies and news sites to develop and update their websites. ⦁ The report recorded that major news agencies don't seek the deployment of their (special news video), as most of the movie fields in those agencies are adapted, while global news sites tend to blend the written material and video on their websites. 83.3% of these websites broadcast news regularly, while 10% of them broadcast news with irregular updates, and 6.6% of the websites do not contain news. 23.3% of the satellite channels have separate news agencies websites, while 76.6% of them provide news on their main websites. 75% of the satellite channels websites have their private sources of information, while 25% of them do not mention weather the published news belong to their own sources or borrowed from other sites. Also 38.4% of the satellite channels refer to the external sources of the news published on their websites, while 61.5% do not. 100% of the satellite channels websites do not refer to the name of their chief editor. 44% of the satellite channels publish opinion articles on their websites. 88.8% of the satellite channels provide direct broadcasting service on their websites, compared to 11% which do not offer this service, while 3.7% of the satellite channels do not offer direct broadcast service, but publish their recorded programs on (YouTube), compared to 7.4% which neither offer direct broadcast nor recorded programs services. 46% of the satellite channels websites refer to the number of visits or readings of news publication. 68% of the satellite channels allow the audience to comment on the news published on their websites. - In reference to the websites related to TV satellite channels, the report recorded an obvious interest of transferring the visible news content to the online service, through a relatively regular wide coverage for Iraq and Arab world events throughout time. - In terms of interaction with the customers, and Instantaneous deal with event, the reports indicated that they are better than other categories, but these ratios remain high compared with the local media, and not with the Arab and international TV channels, which exceed at this field. - A number of Iraqi satellite channels are being censured for not possessing websites till the day, which considered as a fundamental lack of media work. This report have monitored 150 news websites, their concerns distributed among Iraqi general events, regions and provinces, religious and ethical minorities, political and civil institutions, studies and research centres, or active sites that follow up the Iraqi residents in other countries. 35.8% of the news websites refer to the board chairman, chief editor, or editorial board, while 64.2% obscure any information about the names of the staff. Only 13 NEWS websites "8.7%" refer the total number of visits, while 135 NEWS website “91.3%" do not refer to any data about total or partial visits. Only 59 NEWS website "39.9%" indicate the total number of readings with each published theme, while the rest news websites which are 89 " 60.1%" do not provide such counters. Only three news websites "2.02%”, provide breaking news service via text messages, while 145 websites "97.92%" do not provide such service. 105 NEWS websites “70.94%" allow comments on articles, while 43 websites" 29.8%" do not. what should be noted is that the freedom of commenting varies from website to another, out of 150 NEWS website, there are 89 websites "84.7%" imposes restrictions on comments, and 13 websites " 12.3%" allow comments on their FACEBOOK pages , while only 4 websites" 3.8%" allow comments on their main sites and FACEBOOK pages . 21 NEWS websites "14.18%" provide exclusive news, while the quoted news contents varies among sites, where 90 websites ''60, 81%'' adapt most of their materials without referring to the resource, while 37 websites, ''25%'' mention the news resource. It’s difficult to provide an accurate update timing, but during observation of news websites we noticed that about 56 news websites 37.8% update their news content periodically , while 82 news websites 56.7% don’t show timings. And only 10 news websites 6.75% update their news content in limited hours during the day, and among 148 websites 19 website 12.8% appear to be stopped for weeks or for more than a year, in addition to two websites had completely disappeared from the network. ⦁ This report found that the monitored news websites vary significantly in their interests, which made it difficult to classify them whether within the websites that offer news services or specific viewpoints, and mostly the publishers of these news websites provide a guidance information services. ⦁ The essential weakness represented by the declining in the level of constant monitoring of events, and neglecting the rules of profession especially when use a quote or information from other publishers without referring to their names. ⦁ Technically a number of news websites suffer from bad design, also the report observed some technical errors in navigation between windows and other parts of these websites. ⦁ Many of these news websites do not pay attention to linguistics and grammatical rules and do not use linguists and grammarians for this purpose, what presents the published material with many mistakes. ⦁ Some of the monitored news websites are seasonally active due to a particular political circumstances, in the elections period or to report a certain information, otherwise their pages do not updated.